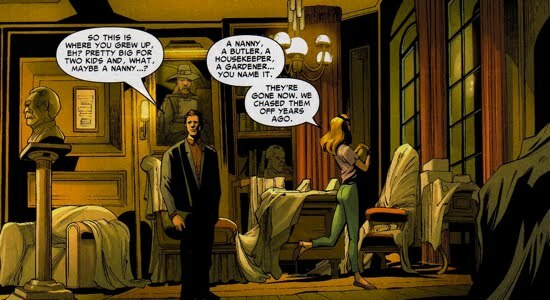 The Sins Past story arc revealed a secret affair between Norman Osborn and Gwen Stacy, an affair that resulted in the birth of twin children, Sarah and Gabriel. At the conclusion of the Sins Past arc, Gabriel's glider had exploded after Sarah shot it with a hand gun defending Spider-Man. Gabriel then plummeted into the harbor, leading to amnesiac spell. Possessing the tainted Goblin genome almost guaranteed the twins would return to Spidey's life one day. In fact, a few weeks after the events of Sins Past, the stress of the rapid aging leads Sarah to once again seek Peter's help. 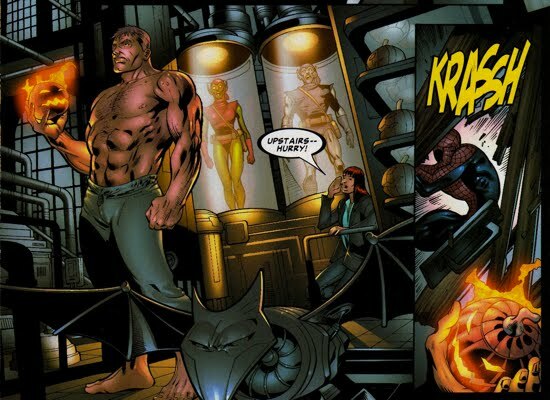 The four part story arc Sins Remembered, featured in Spectacular Spider-Man V2 #23-26, showcases their return and supplements the sparse details surrounding their upbringing under the care of Norman Osborn. 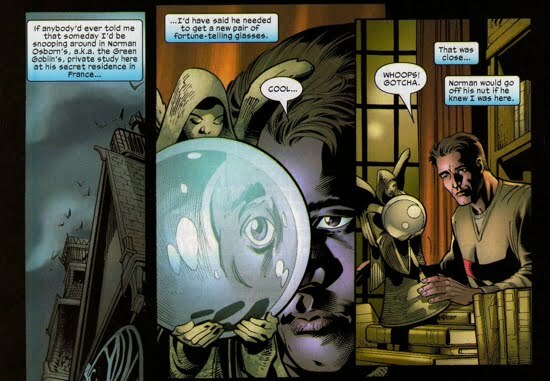 An unsuspecting Peter Parker receives an urgent request from Sarah Stacy's doctor, Dr. Gerard, in France to "come quickly" at the start of Spectacular Spider-Man V2 #23. Peter resolves to go help Sarah since he feels a certain kinship with her from their last encounter. 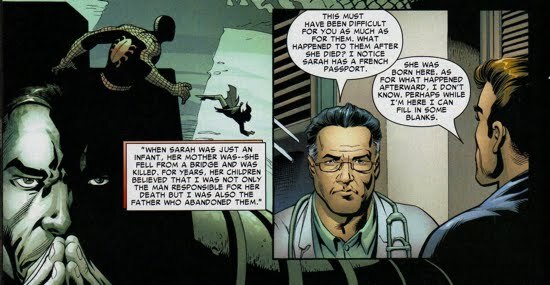 When Peter reaches France he speaks with Dr. Gerard and they discuss Sarah's rapid aging (progeria), her healing factor, and her strength. 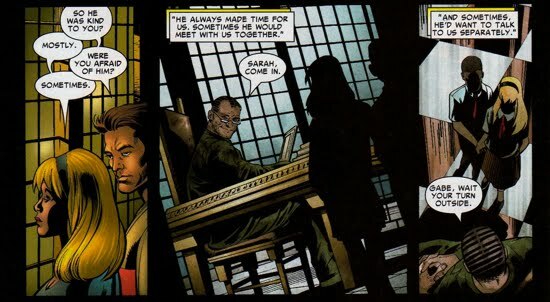 Peter also confirms that Sarah's mother is dead and that her father is Norman Osborn, a "sociopath who is in jail in the U.S." Dr. Gerard then releases Sarah into Peter's custody since he cannot legally force her to do anything further medically. As the two are leaving the hospital Sarah tells Peter that she only remained there to see if Peter would come to "save" her; a crush is developing. Later, Sarah guilts Peter into staying at the "Stacy" estate with her while in Paris. Spectacular Spider-Man V2 #24 contains two intriguing flashbacks that focus on Norman as a parent. The first occurs when Peter is perusing around Norman's private study and he recalls an incident involving Norman and Harry. Peter remembers Norman telling him that Harry, this is before Harry (or Norman for that matter) had died, is not "ruthless enough, not strong enough". 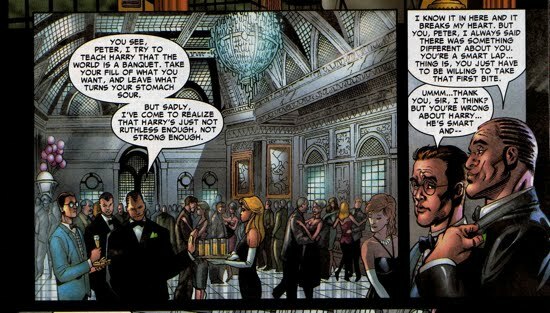 Harry hears all of this and Peter tries to defend Harry to no avail. While Peter is daydreaming, Sarah sneaks up on him, she then proceeds to share some of her memories of the study. 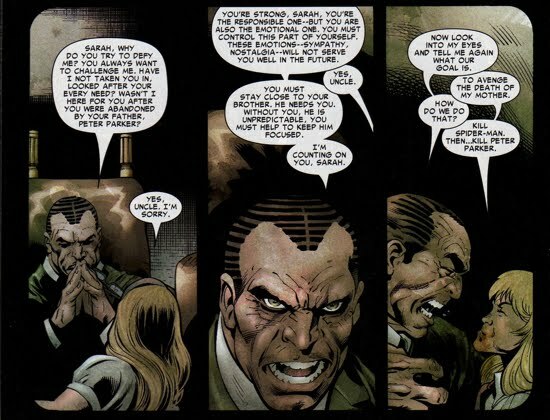 Referring to Norman as "Uncle Osborn", Sarah explains that he was kind at times but also frightening as well. Sarah then recalls an instance when Norman reinforced the fact that she was the "responsible one" and that she must look after her brother to keep him focused. Norman goes on to brainwash by having her convinced that her goal is to "avenge the death of her mother" by "killing Spider-Man…then killing Peter Parker". Later, while touring Paris, it becomes obvious that Sarah has a shady side to her, although Peter is completely unaware of the drastic painkiller addiction that Sarah is currently feeding. After a botched assassination attempt on Peter while picnicking with Sarah, Peter demands to know the truth of what is exactly Sarah is involved with in Paris in Spectacular Spider-Man V2 #25. Sarah explains to Peter that her and Gabriel were frequently bored (no one paid attention to them if Norman wasn't around) and they went out looking for a little fun. They end up becoming the muscle for a local thug named Bruce, the only problem is that as their powers started to develop so did their incessant headaches. Their addiction to painkillers led them to work for Dupres, a thug who took over after Bruce and his gang disappeared. As a ploy to try for one last big score to get out of this illegal racket, Gabriel decides to steal an entire drug shipment from Dupres to sell on his own. This had led to Dupres looking to collect from and or kill Sarah and Gabriel. Meanwhile, MJ, who secretly decided to follow Peter to Paris, happens to walk in as Sarah kisses Peter. This forces MJ to leave, but she soon returns to the mansion only to discover that Sarah had been hiding a mentally deranged Gabriel in the mansion. The final chapter to this story arc occurs in Spectacular Spider-Man V2 #26. Gabriel takes MJ hostage and soon becomes convinced that she is actually Sarah. The real Sarah meanwhile, is breaking into Dupres' residence and threatens to kill him. 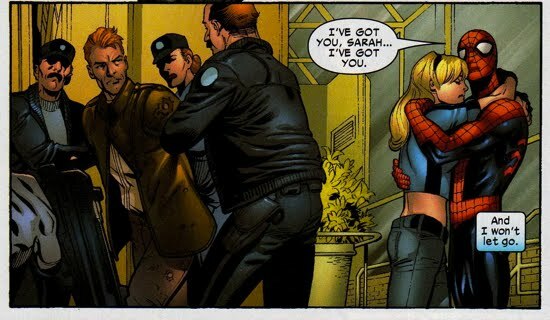 Spider-Man, who had just rescued MJ from Gabriel, is able to talk Sarah out of killing Dupres. Dupres is then handed over to the French authorities. The police even offer Sarah a position within their department and agree to help find a cure for her and Gabriel's disease. Sarah and MJ clear the air regarding the Sarah's kissing Peter as the story arc ends on a relatively happy note.